An injectable damp proof course that easily fills pre-drilled holes. Diffuses within the damp wall forming a water repellent barrier to stop the water passing from one place to another. Applied with a conventional cartridge gun. 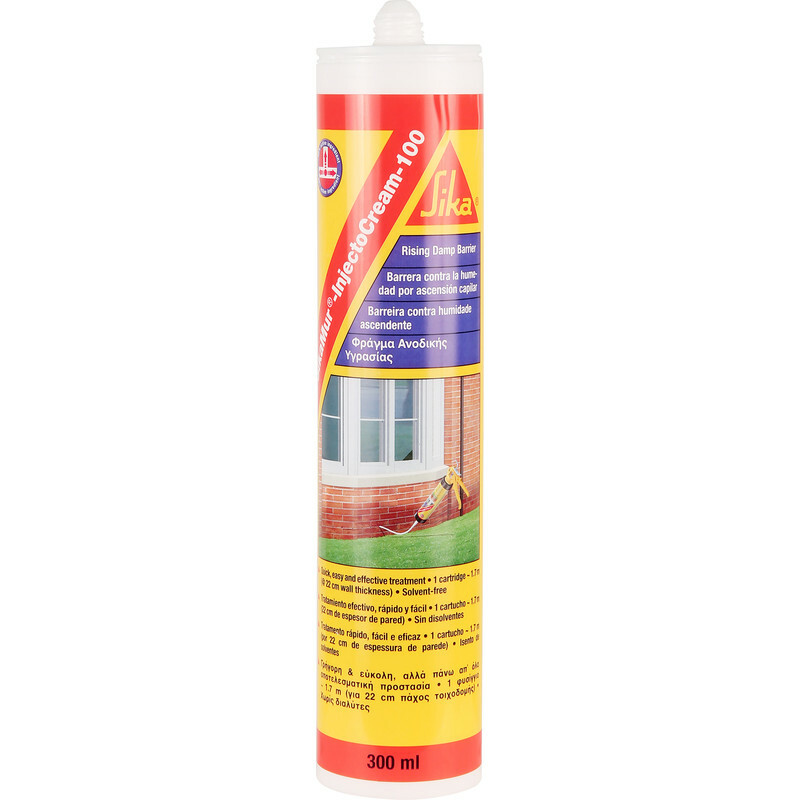 SikaMur InjectoCream Injectable Damp Proof Course 300ml is rated 4.4 out of 5 by 7. Rated 5 out of 5 by Anonymous from Recommended by my Builder/Mate Can't review yet...as job not yet done due to Xmas. Wife doesn't want the hall to look a shambles over the holiday! I'm told it's very effective...just hope one tube will be enough. Rated 5 out of 5 by Walmar from Great product Used before. Product works well every time. Rated 4 out of 5 by bhuplo from easy to apply (thou can get messy) can't rate how good this is for the damp proofing side as i have just applied it in summer. Application was easy but i can see it could get messy if not planned thru. Warning: when you cut open the seal the cream will squirt out. Check website for hole size, depth and how far apart to drill the holes. Preparation is the key for an effective and clean job. Rated 5 out of 5 by ABCs from Rating based on ease of use, not as a DPC. A cream similar to single cream and will run. Time will tell if it has worked as a Damp Proof Course. You will require hammer drill and a bit to suit diameter and depth, to penetrate to specified hole length. Instructions and details of the product can be found on the manufacturers web site, so worth a check before you purchase. Also I used a length of tubing to go on the nozzle. This helped to fill the cream to the bottom of the hole. Rated 4 out of 5 by D Latts from Simple to use This product was Simple to use, fitted straight into a standard skeleton gun. Rated 3 out of 5 by Edro from Does the job but Does the job but the manufacturer should design some sort of Non-Leak Squeeze nuzzle, similar to some ketchup bottles!, as it leaks allover the place while working.